There are numerous dishes which you can prepare with beans, but the taste that it gives after blending in a salad is simply terrific. Therefore, when it comes to bean salads, Sweet Pepper Bean Salad with Balsamic Vinaigrette is one such salad that will attract your attention most. It has got decent liking rate, not only because beans are used in it, but due to the fact that it can be eaten alone rather than a side dish for dinner. The dressing of Sweet Pepper Bean Salad with Balsamic Vinaigrette makes it more delicious alongside presentable. In addition to this, the recipe of the salad is very simple and it also does not take much time in getting ready. So if you are facing time restraints then, Sweet Pepper Bean Salad with Balsamic Vinaigrette is the best option to go with. 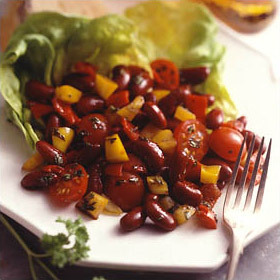 Take a large bowl in which combine beans, tomatoes, yellow pepper and roasted red peppers. After that take a jar with tight fitted lid and add vinegar, parsley, sugar, garlic, Worcestershire sauce and basil in order to shake all these ingredients well. When this mixture gets shaken well then, tranfer the vegetables into this jar and toss them together gently. After tossing these ingredients cover the jar and leave it aside for 30 minutes at room temperature or place it in the refrigerator for about 2 hours. When ingredients gets to sit for 2 to 3 hours then, it is ready to dish up on leaves of lettuce that are placed in separate salad plates. Then top each individual plate of salad with the bean mixture and serve it to the guests.